Among those who were attacked are Serbian Left president Borko Stefanović and two Serbian Left party activists, who was beaten with iron bars in the city of Kruševac; another assassination attempt was directed at the journalist Milan Jovanović. The opposition has demanded that Vučić accede to a set of demands around respect for basic human rights; in response, Vučić has said that he would not accede to the demands, "even if five million people show up on the streets" (Serbia's population is six million). In response, protesters have taken up the slogan "#1od5miliona ("one in five million"). Protesters are also marching under the slogan "#STOPkrvavimkošuljama ("stop bloodying shirts") in reference to a TV appearance by Stefanović in which he showed the bloody shirt he was wearing when he was beaten. 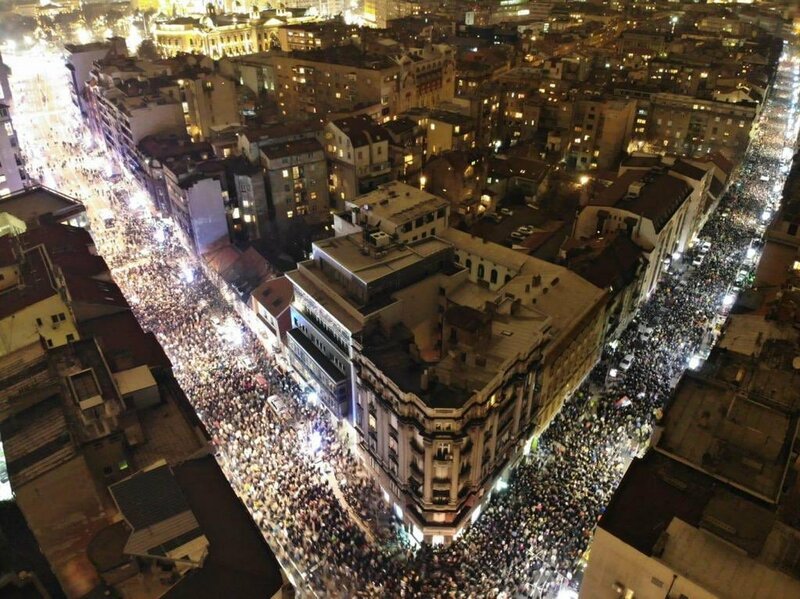 The protests have united Serbia's left and right for the first time since the 1990s, when similar protests brought down the regime of genocidal dictator Slobodan Milošević (in whose cabinet Vučić served). Another slogan spotted both in the streets and on social media says “it has begun” (#počeloJe), a cry of hope that the protests would grow into a country-wide movement similar to that of the late 1990s. In the past decade, Aleksandar Vučić has re-branded himself as a moderate centrist by paying lip service to Serbian integration into the European Union, something his opponents claim is mere camouflage of both his growing authoritarian tendencies at home and his servility to the Kremlin. So far, he has shrugged off the protests. While government-controlled media has attempted to minimize their size and importance, Vučić himself has dared his opponents with talks of a snap election which near-total party control over state institutions and media would likely hand him victory. Opposition leaders have said they would boycott such a move.